The musical Cinta Tak Pernah Sederhana is a dazzling tribute to love poems by 26 Indonesian renowned poets. Held by Titimangsa Foundation and publisher Balai Pustaka on March 16 and 17 at the Teater Jakarta in Taman Ismail Marzuki arts and cultural center in Central Jakarta, the play was directed and written by Agus Noor with six of Indonesia's finest actors taking the main roles -- Reza Rahadian, Marsha Timothy, Chelsea Islan, Atiqah Hasiholan, Teuku Rifnu Wikana and Sita Nursanti. 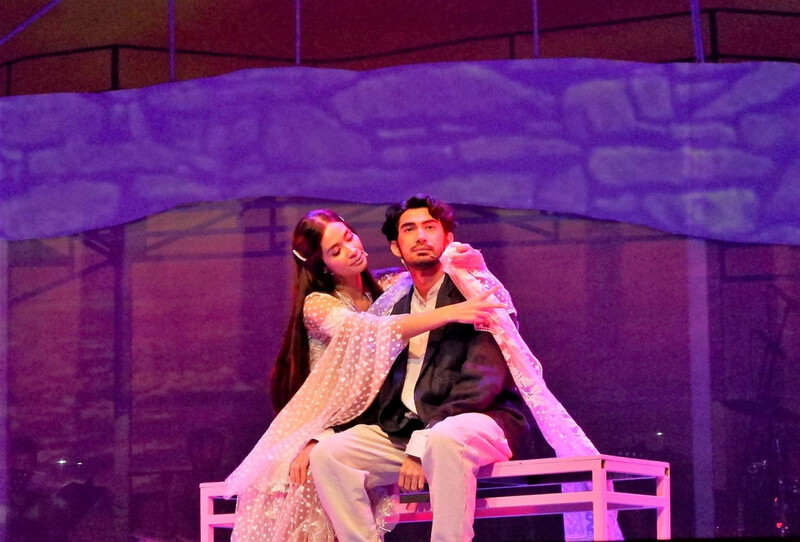 In the musical, the dialogs were taken from poems about bittersweet love, such as Chairil Anawar’s "Aku" (I), Goenawan Mohamad’s "Pada Sebuah Pantai" (On a Beach), Cecep Syamsul Hari’s "Syair Kesedihan" (Rhyme of Sadness) and Aan Mansyur’s "Ibu yang Menunggu" (A Waiting Mother). On stage, the performance was unlike regular poetry readings. The main cast, who are not singers except Sita Nursanti, sang some of the poems live, such as "Kangen" (Longing) by WS Rendra, "Dunia Dangdut" (Dangdut’s World) by Joko Pinurbo and "Pada Suatu Hari Nanti" (One Day) and "Hujan Bulan Juni" (Rain in June) by Sapardi Djoko Damono. With Iskandar K. Loedin’s scenography, Bintang Indrianto’s music arrangement and Josh Marcy’s choreography, the six actors delivered a top-notch performance, captivating the audience for two hours from start to finish. Cinta Tak Pernah Sederhana begins with Adam (Reza), the first man in Eden. After he is created, the first thing he learns is words, which later become a language. The more words he knows, the more he understands everything around him. When he knows about love, he feels lonely. This changes after God creates Eve (Marsha) for him. Adam and Eve fall for each other. They are the first lovebirds in Eden. They commit to love each other in a simple way. However, it turns out that to maintain love is not as simple as they think. They later break up. After being sent down to Earth, Adam becomes a poet (Teuku), who falls in love with a dangdut singer (Atiqah). She also loves him but doubts whether he is the right man for her. He fights to win her heart. However, love is never simple. Her job causes her to become the subject of unwanted rumors. As she is deemed sinful and immoral, people around her throw stones at her. The poet is late in coming to her rescue. She takes her last breath in his arms. In despair, the poet’s life spirit revives after he meets his secret admirer (Sita). When love between them blossoms, he is arrested and then burnt alive. On fire, he finds spiritual values that make him feel closer to his true love: God. Producer Happy Salma, who co-founded Titimangsa Foundation in 2007, said the idea to combine poetry with music and bring it onto the stage crossed her mind after she was mesmerized by "Karma", a song by renowned guitarist Dewa Budjana the lyrics of which were written by Putu Wijaya. She was again blown away by the performance of White Shoes and the Couples Company band singing Chairil Anwar’s poems for a play titled Perempuan-Perempuan Chairil (Chairil’s Women). The play, which Titimangsa Foundation staged in 2017, was also directed by Agus Noor. “When I chatted to Agus about the possibility of realizing my idea, he was enthusiastic about it and wanted to develop it into an unexpected concept. For a man like Agus Noor, nothing is impossible,” she said. Happy was thrilled when publisher Balai Pustaka showed interest in partnering with Titimangsa Foundation for Cinta Tak Pernah Sederhana. The publisher’s president director Achmad Fachrodji raised hope the musical would make more people, especially youngsters, familiar with the country’s first publisher and love Indonesian literature even more. He was also happy because one of the 26 poets whose works were performed in the musical was Subagio Sastrowardoyo, the publisher’s former president director who passed away in 1995. Since it was founded 102 years ago, he said, Balai Pustaka has been home to Indonesian literature, such as the classical works Layar Terkembang (Set Sail) and Salah Asuhan (Never the Twain) that are still known by Indonesian people to date.